I love children's literature. One of my favorite college courses was an elective on Children Lit. Writing and illustrating children's books is something I do when I have time, though I have never taken it past creating them. Literature is something that I formed many lessons around when teaching in classrooms. It is a huge passion of mine, and something I wanted to pass onto my son when I found out I was pregnant. My baby shower ended up being the day before Skyler was born, one month and one day before his due date. It was a book themed baby shower. Books were gifted to my baby boy, inscribed with loving messages from family and friends (I look forward to reading those messages with him when he is older). When Skyler was in the special care nursery for two weeks after his birth, Joe and I always brought books to read to him. 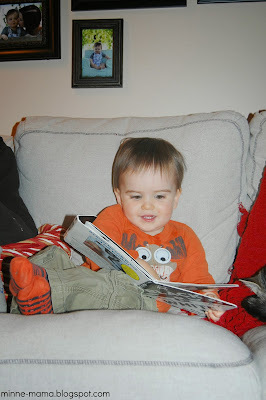 Even in those first days of his life, reading books was something special we did. It has remained one of our favorite things to do as a family. In our ECFE class a couple of weeks ago we were asked what our child's favorite toy was. 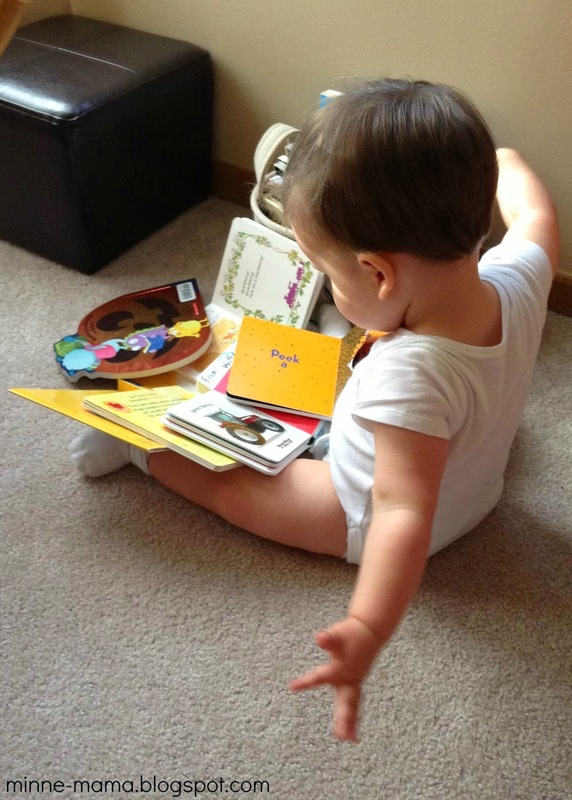 Skyler's favorite 'toy' is books, without a doubt. I was asked how I knew this was his favorite. We have books everywhere throughout our house. There are books on shelves and bins in his room, a bin and shelf in our living room, a bin in the car and we usually have a few in the diaper bag. 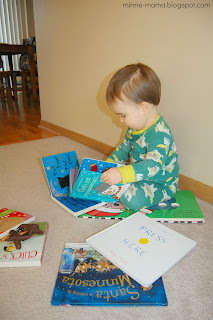 Books are almost always the first thing he will go to in a room and he always brings books to me when he wants to cuddle (ever since he was able to maneuver with a book in his hand, before that he would say "book! book!"). We probably read books around five times a day together, plus he will read them independently throughout the day. 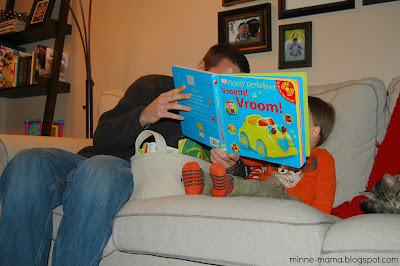 Skyler loves to be read to by others. As a baby he would smile and coo, when he got older he would hold up books to us, and now he will ask anyone around to read to him! 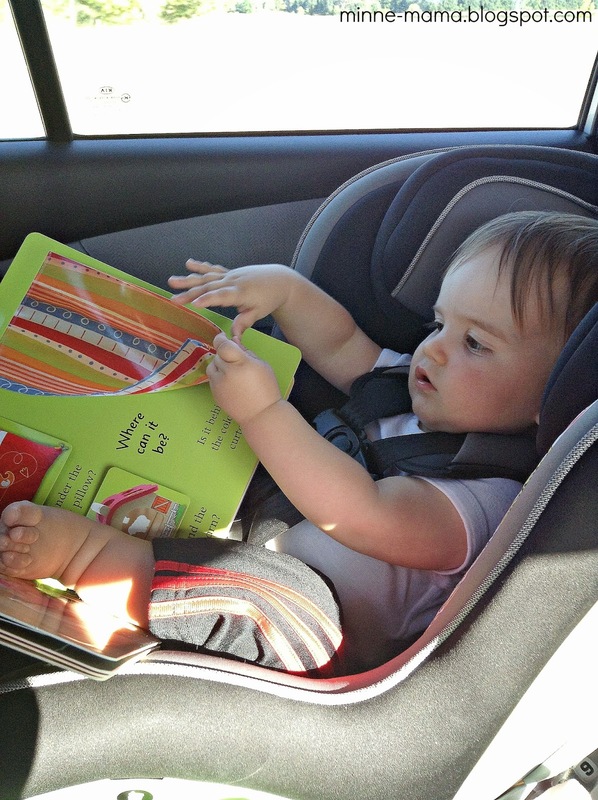 If Skyler has a book in the car, he will be happy. We can have a twenty minute car drive, and he will just sit and read a book over and over. Since I know the books he has, we can still talk about it as he looks at the pages. Check out that serious face! After putting bookshelves on the walls in his room, we got him a little armchair for his birthday. He was also given a rocking chair for his birthday. He can usually be found in one of his chairs, the armchair in his room, or the rocking chair in the living room. His favorite thing to do is stack book after book around him or on his lap as he reads through all of his favorites. 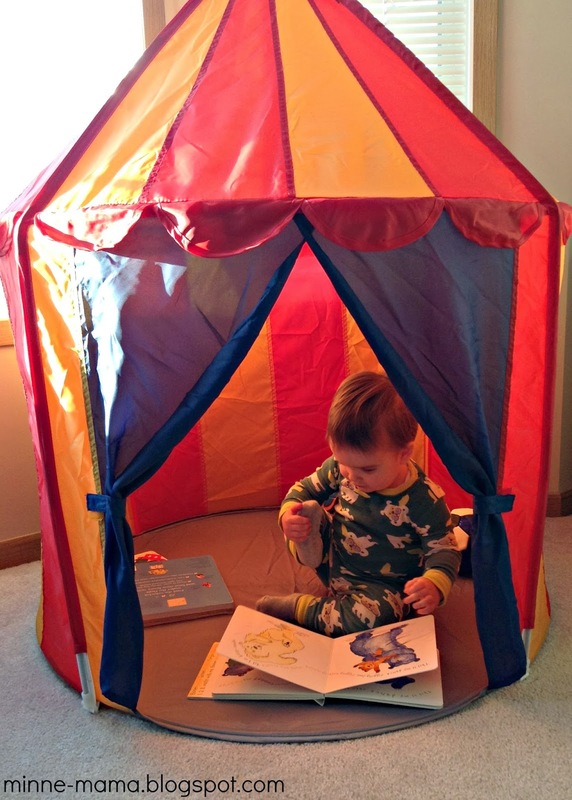 Today, he enjoyed reading his new books from Christmas, especially in his new tent! The collection of books we have is such a great mix, chosen by family and friends, and supplemented by us. I think, other than being read to early on and often, that having ample opportunity and easy access to books has helped to promote early literacy and a love of books for Skyler.